Sphagnum moss is a general name assigned to any of approximately 200 to 300 different species of mosses (Sphagnum spp.) around the world. As these mosses die and decay, peat moss or simply "peat" is formed and traditionally is harvested and utilized as potting soil medium or to improve the moisture-retaining quality of garden soil. According to the Blue Planet Biomes website, this peat moss is the precursor to coal, which is made after hundreds of millions of years of compression. The vast majority of sphagnum mosses are native to the Northern Hemisphere. Depending on the species, some grow exclusively in the tundras at the rim of the Arctic Circle and others in more temperate reaches of central North America, Europe and Asia. There are tropical (frost-sensitive) sphagnum mosses that can be found in pockets in South America, Africa and southern Asia. Filled with green pigments to produce food via photosynthesis, sphagnum mosses tolerate full sunlight intensity to shaded but very bright indirect light. In polar regions, full sun exposures during the long summertime hours are not harmful since the ray intensity is not brutally strong. In regions closer to the equator, moss species must be able to tolerate more intense sun rays in all seasons. Some species may grow in the dappled shade or half-day sunlight in forest openings or in the shadow of rocks, taller shrubs or trees nearby. Generally, sphagnum mosses do not grow in topsoil. According to Blue Planet Biomes, these mosses create their own growing medium--living upon the dead, decaying compost of their old stems and leaves. Not having roots, sphagnum mosses grow into dense mats of self-made organic matter, with the dead tissues compounding into thick, water-retentive "soil-like" substrate comprising a bog or fen. Gleaning nutrients necessary for plant growth from rainwater and the decaying peat itself, sphagnum moss creates an organic mat that has an acidic pH (7.0 or lower). 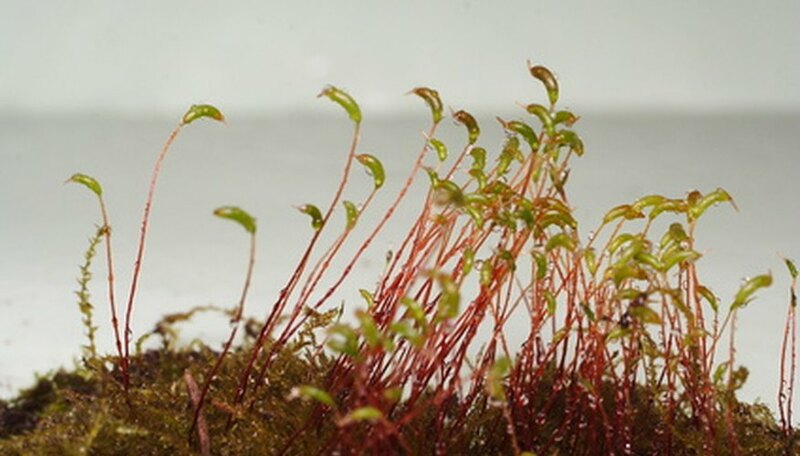 Other acidic soil-loving plants that do not need high amounts of nutrients and mosses can also grow in the peat created by the sphagnum mosses, forming a small ecosystem. Depending on the climate and area of the world, companions like carnivorous plants, heaths, cranberries, blueberries and fast-growing alpine or polar wildflowers grow in the peat. Various insects survive on the sweet flower nectar or fruits of the plants, which in turn can attract spiders, small birds and mammals.